The Opus 23 genetic interpretation software  checks for ABH secretor status as part of the hereditary genetics algorithms. Knowing whether your client is a secretor or non-secretor is important for many reasons, one being that non-secretors have increased levels of serum vitamin B12. This is a well known association: at least five GWAS studies found SNPs in FUT2 show the strongest statistical association with circulating vitamin B12 [2-6]. Two of these studies also report a 10-25% increase in circulating total vitamin B12 concentration in homozygotes for the common non-secretor alleles, as determined by the FUT2 genotype of the nonsense stop-gain mutation W143X, rs601338. The mechanism for this is however unclear. Chery et. al. Proposed that FUT2 genotype could affect the glycosylation status of another vitamin B12 transporter, gastric intrinsic factor (GIF) . This was a small study however, and although a potential effect was observed on GIF secretion and glycosylation according to FUT2 rs601338 genotype, the GIF phenotypes of the FUT2 rs601338 GA heterozygotes more closely aligned with those of the non-secretor genotype (AA) than those with the secretor genotype (GG). It is currently unclear to what extent FUT2 genotype influences GIF secretion and thereby alters vitamin B12 concentration in the general population. The authors reported that FUT2 genotype influences the concentration of haptocorrin-bound vitamin B12 to a far greater extent than transcobalamin-bound vitamin B12. This is consistent with FUT2 exerting influence via its fucosylation function, as haptocorrin is a glycosylated protein and transcobalamin is not. They also suggest that FUT2 activity impacts the intra-organismal recycling of vitamin B12, not the absorption and assimilation of the vitamin from the diet. In both the H. pylori and the GIF models described above, FUT2 genotype would alter the pool of vitamin B12 absorbed from the gut. As vitamin B12 transported from the gut binds to transcobalamin in plasma, these models are not consistent with the data from Velkova et. al., which shows that FUT2 genotype influences the concentration of haptocorrin-bound vitamin B12 to a far greater extent than transcobalamin-bound vitamin B12. The connection between secretor status and B12 levels is consistent with FUT2 exerting influence via its fucosylation function on B12 carriers, as haptocorrin is a glycosylated protein and transcobalamin is not. It also suggests that FUT2 activity impacts the intra-organismal recycling of vitamin B12, not the absorption and assimilation of the vitamin from the diet. This could be the reason why the standard test for vitamin B12 has significant false positive and false negative rates: only ~20% of circulating vitamin B12 (holoTC) represents the “active” bioavailable form, meaning that the most commonly ordered clinical test for vitamin B12 mainly measures the holoHC, which could mask an existing vitamin B12 deficiency. When evaluating or confirming vitamin B12 deficiency, additional markers of vitamin B12-dependent enzyme activity such as methylmalonic acid (MMA) and total homocysteine are also problematic. FUT2 secretor status may therefore be useful when considering the overall B12 status of an individual, and non-secretors may appear to have falsely elevated serum total B12 when compared with active B12. Opus 23 handles a range of raw data files, however Ancestry.com and Genos data files do not include the rs601338 SNP, which denotes the non-secretor mutation when homozygous. When only these data files are loaded Opus 23 looks for another SNP on FUT2 that is reported in Ancestry.com and Genos raw data files, and which is in perfect linkage disequilibrium with rs601338. This will give you the client’s imputed secretor status, and therefore indications for interpreting serum vitamin B12 tests. Opus 23 also checks for another FUT2 non-secretor SNP found only in Asians and not in Caucasians when looking for secretor status. 1. Opus 23 Pro genetic analysis and reporting software by Dr P. D’Adamo www.opus23.com. 2 .Hazra, A., Kraft, P., Selhub, J., Giovannucci, E.L., Thomas, G., Hoover, R.N., Chanock, S.J. and Hunter, D.J. (2008) Common variants of FUT2 are associated with plasma vitamin B12 levels. Nat Genet, 40, 1160-1162. PMID 18776911. 3. Lin, X., Lu, D., Gao, Y., Tao, S., Yang, X., Feng, J., Tan, A., Zhang, H., Hu, Y., Qin, X. et al. (2012) Genome-wide association study identifies novel loci associated with serum level of vitamin B12 in Chinese men. Hum Mol Genet, 21, 2610-2617. PMID 22367966. 4. Tanaka, T., Scheet, P., Giusti, B., Bandinelli, S., Piras, M.G., Usala, G., Lai, S., Mulas, A., Corsi, A.M., Vestrini, A. et al. (2009) Genome-wide association study of vitamin B6, vitamin B12, folate, and homocysteine blood concentrations. Am J Hum Genet, 84, 477-482. PMID 19303062. 5. Grarup, N., Sulem, P., Sandholt, C.H., Thorleifsson, G., Ahluwalia, T.S., Steinthorsdottir, V., Bjarnason, H., Gudbjartsson, D.F., Magnusson, O.T., Sparso, T. et al. (2013) Genetic architecture of vitamin B12 and folate levels uncovered applying deeply sequenced large datasets. PLoS Genet, 9, e1003530. PMID 23754956. 7. Kaptan, K., Beyan, C., Ural, A.U., Cetin, T., Avcu, F., Gulsen, M., Finci, R. and Yalcin, A. (2000) Helicobacter pylori–is it a novel causative agent in Vitamin B12 deficiency? Arch Intern Med, 160, 1349-1353. PMID 10809040. 8. Carmel, R., Perez-Perez, G.I. and Blaser, M.J. (1994) Helicobacter pylori infection and food-cobalamin malabsorption. Dig Dis Sci, 39, 309-314. PMID 8313813. 9 Ikehara, Y., Nishihara, S., Yasutomi, H., Kitamura, T., Matsuo, K., Shimizu, N., Inada, K., Kodera, Y., Yamamura, Y., Narimatsu, H. et al. (2001) Polymorphisms of two fucosyltransferase genes (Lewis and Secretor genes) involving type I Lewis antigens are associated with the presence of anti-Helicobacter pylori IgG antibody. Cancer Epidemiol Biomarkers Prev, 10, 971-977. PMID 11535550. 10 Magalhaes, A., Rossez, Y., Robbe-Masselot, C., Maes, E., Gomes, J., Shevtsova, A., Bugaytsova, J., Boren, T. and Reis, C.A. (2016) Muc5ac gastric mucin glycosylation is shaped by FUT2 activity and functionally impacts Helicobacter pylori binding. Sci Rep, 6, 25575. PMID: 27161092. 11. Oussalah, A., Besseau, C., Chery, C., Jeannesson, E., Gueant-Rodriguez, R.M., Anello, G., Bosco, P., Elia, M., Romano, A., Bronowicki, J.P. et al. (2012) Helicobacter pylori serologic status has no influence on the association between fucosyltransferase 2 polymorphism (FUT2 461 G->A) and vitamin B-12 in Europe and West Africa. Am J Clin Nutr, 95, 514-521. PMID 22237057. 12. Chery, C., Hehn, A., Mrabet, N., Oussalah, A., Jeannesson, E., Besseau, C., Alberto, J.M., Gross, I., Josse, T., Gerard, P. et al. (2013) Gastric intrinsic factor deficiency with combined GIF heterozygous mutations and FUT2 secretor variant. Biochimie, 95, 995-1001. PMID 23402911. 13. Velkova A, Diaz JEL, Pangilinan F, et. al; The FUT2 secretor variant p.Trp154Ter influences serum vitamin B12 concentration via holo-haptocorrin (holoHC), but not holo-transcobalamin (holoTC), and is associated with haptocorrin glycosylation, Hum Mol Genet, Volume 26, Issue 24, 15 December 2017, Pages 4975–4988. PMID 29040465. The recent change in the reporting done by 23andMe from the V4 to V5 chip has thrown things into a bit of a dither. The earlier V4 SNP array was more robust, at least with SNPs of interest to those who work in nutrigenomics. For example, V4 reported over ten MAO SNPs of nutritional interest, whist V5 reports none. To circumvent the problem, I’ve recoded Opus 23 to allow the clinician to upload, singly or in combination, data files from 23andMe (V3, V4, V5), Ancestry DNA and the ‘Export to Promethease’ file available from Genos. To move Opus in this direction required a lot of recoding and I thank all our users for their support and patience. The first time you load an existing client profile into Opus it will take a bit longer to process the file. This is because they are being upgraded to the new data storage system. After that they should load as usual. Manage->Profiles->Append Raw Data to Current Client will take you to the BLENDER app,which allows you to merge raw data files. This will only be important as people begin to use Ancestry DNA, perhaps in combination with 23andMe V5. Since almost everyone currently in Opus is 23andMe V4 you really don’t need to do anything. The ‘Upload New Client Raw Data’ script has been extensively re-written. You still upload a ZIP file, but the script will identify the platform (V3/V4, V5, Ancestry DNA) and let you know. It also now features and extra screen so that you can verify/validate your form input before doing the final upload. Hopefully this will cut down on people contacting us having uploaded the same client twice. Uploading and merging V5 and Ancestry DNA client data have about 74% of Opus-curated snps, while the prior V4 has about 79% coverage. If you do upload Ancestry DNA data, be advised that Ancestry names its raw data files in a non-unique manner, usually something like ‘dna-data-2017-09-03.zip’. This blunts the ability of the program to warn you that you are using the same data file on two different clients. You should rename the client raw data ZIP file on your hard drive to something unique (we recommend replacing Ancestry DNA filename with the client’s first and last initials and date of birth; in this case ‘dna-data-2017-09-03.zip’ might become ‘MG-11-22-1956.zip.’ But you can use any system you wish as long as each uploaded filename is unique. It looks like the best short term solution will be to have the client do BOTH 23andme V5 and Ancestry. Opus 23 now allows you to sequentially upload the raw data and merge it. We will eventually move towards a dedicated chip. However this change from v4 to v5 caught everyone (not just Opus/Datapunk) flat-footed as to the huge drop in clinically significant SNPs that are reported in v5. Even in the best of circumstances it will be weeks and months until a specialized chip will become available. However, in the meantime, piggybacking 23andMe v5 with Ancestry DNA appears to be not all that bad of a temporary fix. Many of these SNP panels are having significant price drops, so having the client do bot 23andMe V5 and Ancestry DNA should not be prohibitively expensive. 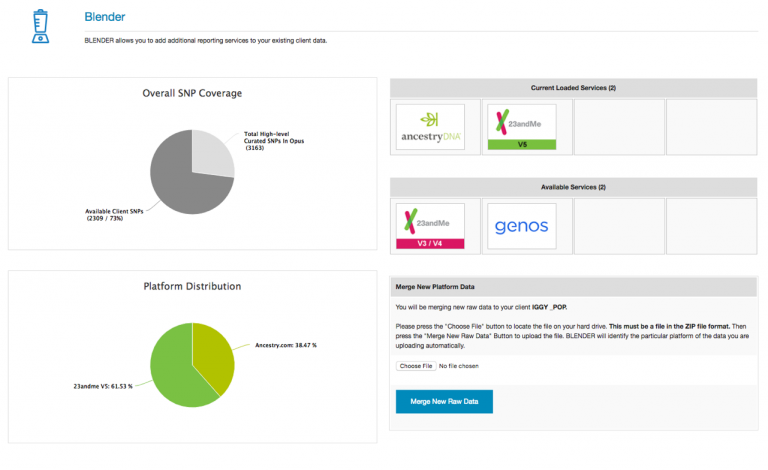 You can now compare V5, V4, Genos Promethease export, and Ancestry data as compared to the core 2600 Opus snps. Just log in, click the ‘Informatics’ pull down, the select ‘Tools/ Extras’ and “Platform Comparisons’. Table is searchable, sortable and filterable. 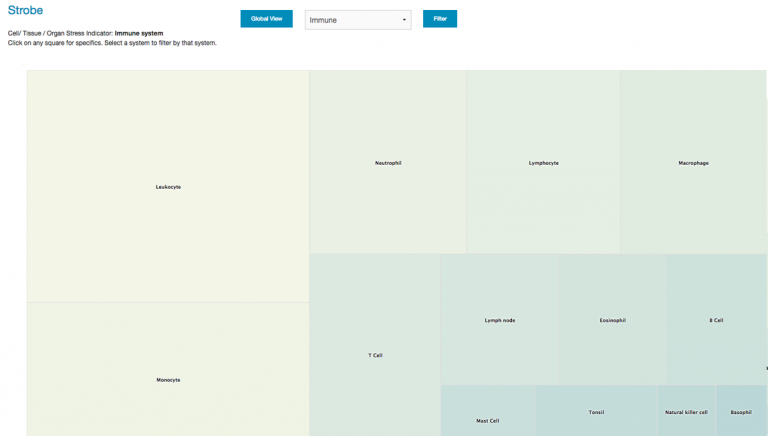 Opus 23 provides many unique opportunities for data integration and visualization. One app that I’ve just been added to the Opus toolbox is STROBE, a new Opus analytic app that allows you drill-down client genomic data by organ, tissue or cell distribution. To do this Opus mashes up its own internal SNP data with gene tissue expression data derived from a variety of public databases. I then sub-organized the tissue expression data by system (immune, cardiovascular, etc) so that the user could filter by clinical relevance. Once STROBE is fired up you’re presented with the screen depicted above. It is a typical squarified heat-map rendered in Highcharts. Values are assigned by virtue of the aggregate power factors of client SNP mutations number of genes associated with that tissue. Clicking on any tissue brings up a modal popup with a Manhattan-type gene distribution display. Y axis shows cumulative power factors of SNPs testing positive for that gene. The X axis is rough approximation of gene locus position. Yellow points indicate genes with exclusively heterozygous mutations. Orange points denote genes that contain homozygous mutations. Drag a rectangle around any area to zoom into that part of the map. Use the ‘Reset Zoom’ to return to full zoom. Clicking on any data point to bring up the information screen on that gene. Here you can notate, or even move on to examining SNPS, agents and algorithms associated with the gene. 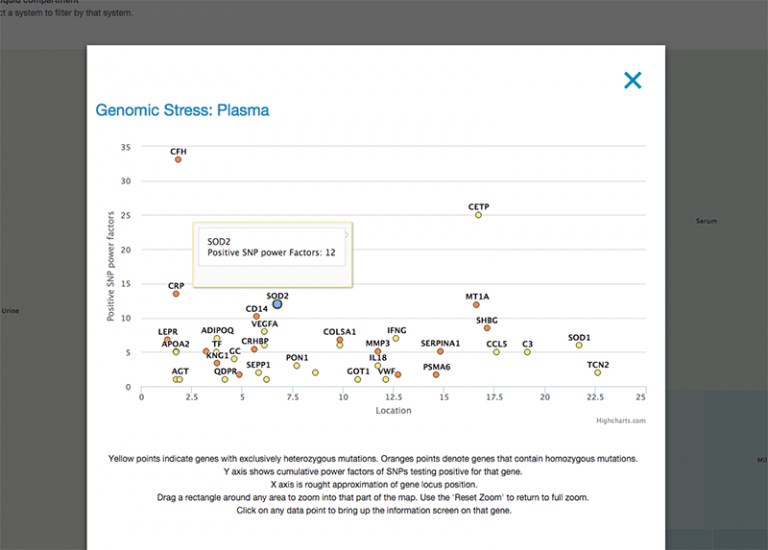 The Opus 23 PSYCHIC app allows you to search for natural products known to control gene expression. However, unlike a simple search engine, PSYCHIC is able to crawl up and down the molecular ‘Interactome’ (protein-protein interactions and gene expression data) to determine the upstream and downstream genes that interact with the gene you’ve searched for. In addition PSYCHIC allows you to chose which type of natural products (agonists/ antagonists) to include in the upstream and downstream results. As seen above, when the PSYCHIC screen loads you will be presented with the results of the default search term for the current client, the MTOR gene. The main infographic is comprised of a bar graph divided into two halves. The left half displays the upstream results, while the right half displays the downstream results, based on MTOR’s position in the interactome. The labels along the x-axis display the various natural products and their gene targets PSYCHIC has found that meet the search criteria. The y-axis value of each bar in the graph is determined by the evidence basis and strength of the position in the network for the gene depicted. At the bottom is a small half-pie chart depicts the SNPs for that gene contained in the Opus 23 Pro database. To select a gene to run in PSYCHIC, simply begin typing in its gene symbol in the text input field; PSYCHIC will auto-complete the entry with any genes for which it has data. If multiple options are displayed, simply select the gene you wish to analyze. When you’re ready, press the ‘Run Psychic’ button to have PSYCHIC run results. 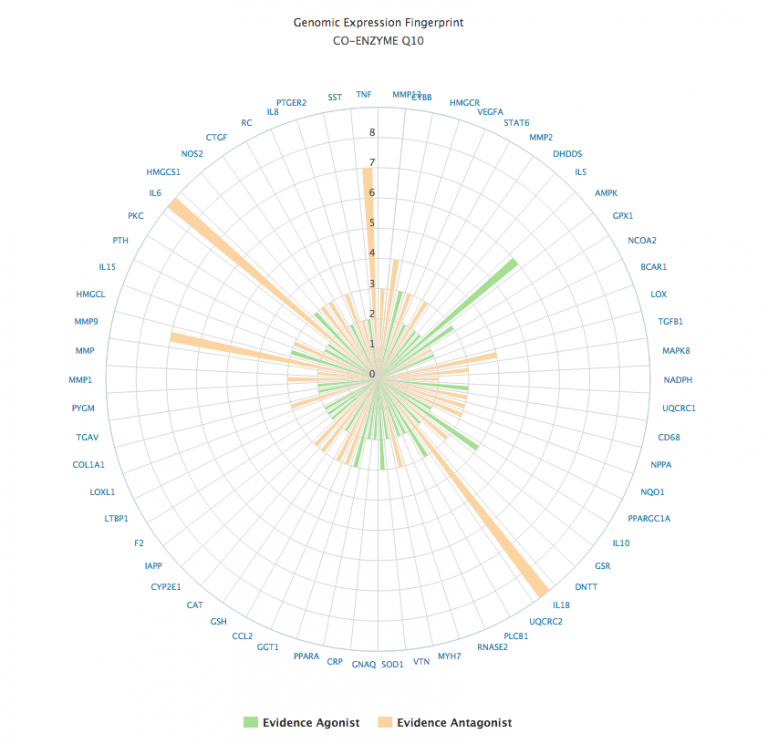 PSYCHIC uses highcharts.js for its data depiction, the CPAN Perl module graph.pm for creating the abstract data structures, the PPI (protein-protein interactions) database, and Opus 23’s own internal agent/gene expression database of PubMed citations. Initially, I was very excited about the prospect of allowing the import of ancestry.com DNA data into Opus 23. After all, they use the same Illumina technology as 23andMe (although 23andMe apparently have their own unique chip.) Initial testing was promising. Like 23andMe, Ancestry supplies raw data in a basic tab-delineated text file. It’s in a slightly different format, but there as no problem parsing it. In fact Ancestry offered several possible advantages over 23andMe. It retails for $99 USD, which used to be what 23andMe charged, until they were cleared by the FDA to supply some very basic health insight data, at which time they hiked the price of the test up to an almost extortionate $199 USD, because now they can tell you what color eye you might have and whether your earwax is soft or hard. Ancestry SNPs are all reported with the ‘rs’ number. In order to cross-reference SNPs in any of the bioinformatics databases, we need their official id number, which is, as per dbSNP, referenced as ‘rs[the id number]’. 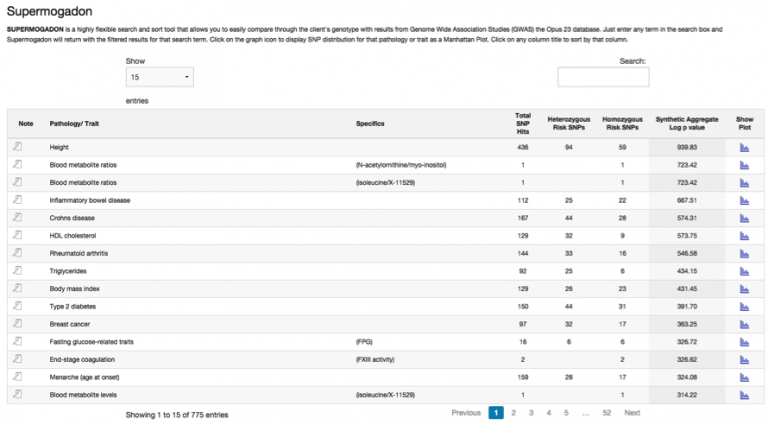 For example the SNP main SNPs (C677T and A1298C) for the MTHFR gene are rs1801133 and rs1801131. 23andme uses a lot of internal SNP ids, which they prefix with an ‘i’. The internal references usually do indicate SNPs that otherwise have rs id numbers, and if you are dogged enough, you can usually get the proper rs id for an internal SNP, but they don’t make it easy. Problems arose when it occurred to me that it would be prudent to cross-compare the Ancestry and 23andMe SNPs with the basic Opus 23 curated SNP database. 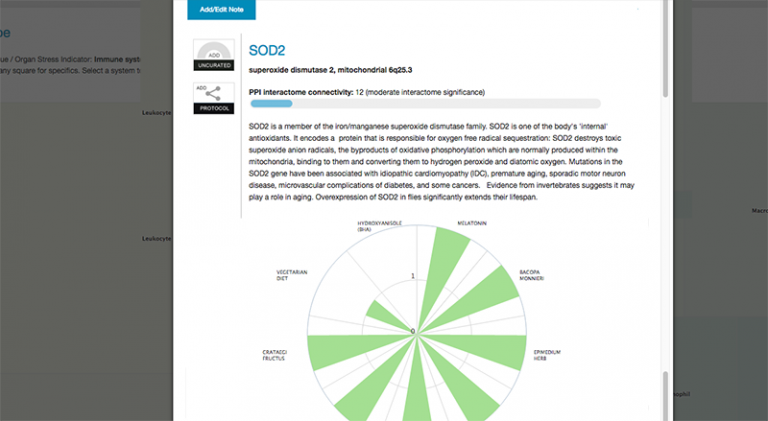 Opus 23 accesses several SNP databases, but its own internal database is the jewel in the crown, hand-curated by our developers with special reference to clinical utilization and nutrigenomics significance. So I wrote a simple Perl script to do the work. The results were depressing, to say the least. 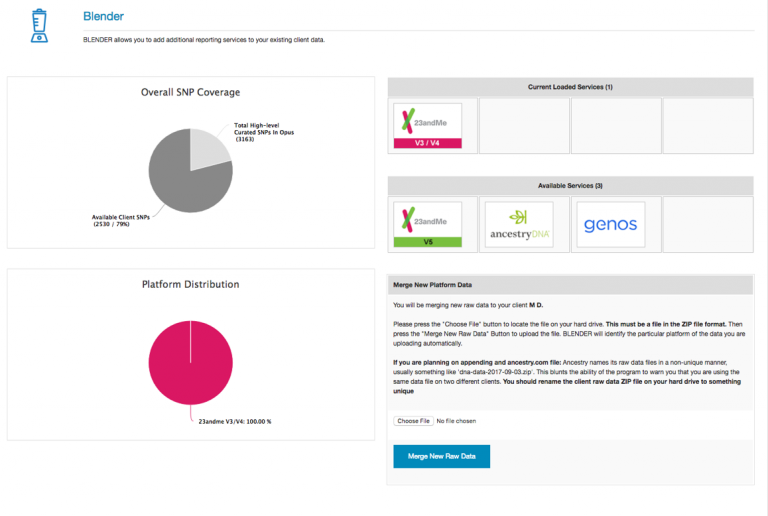 Roughly 35-40% of the SNPs in the Opus curated database that are reported by 23andMe are not reported by Ancestry. And some of these are biggies, like the SNPs that control secretor status on FUT2. This leads me to believe that the Ancestry DNA analysis is skewed towards genealogy determination (perhaps not surprisingly) and not health outcomes. There has been an explosion of interest in the microbiome. Outfits such as uBiome has made it relatively inexpensive and easy to have your microbiome profiled. These services extract the bacterial DNA out of the sample and identify each of the bacteria that the DNA came from. There appear to be some limitations with the technology. I’ve been told by sources whom I consider informed that uBiome is not that accurate the deeper into phylogeny. Genera data may only be 40-60% reliable by some estimates. So while the major distinctions such as phylum and class may be reliable, drilling down to the precise distribution amounts of particular species may not be so helpful. 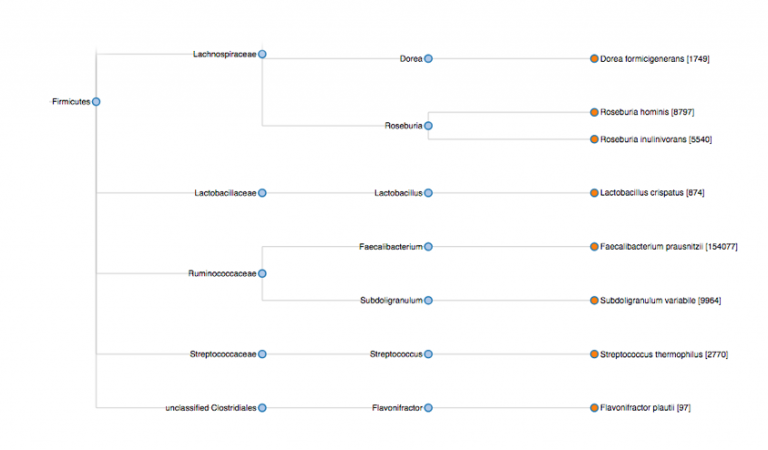 Nonetheless there may be some advantages to importing microbiome data into Opus 23 Pro. From a research perspective we’d have the benefit of cross-comparing genomic data with microbiome data, and the ability to perhaps correlate dietary changes based on genomic analysis with progressive changes in sequential microbiome samples. One advantage is the ease of working with uBiome raw data. The most basic raw data you can download is a simple JSON data file that usually runs about 30K in size, so we’re not talking about any sort of server stress. This data is straightforward enough to parse. The image above was generated out of some basic uBiome data and ported to a visualization script (D3.js) to produce a sunburst information distribution. Although this feature will probably not ship with Opus 23 Pro when it hits the pavement in January, I’ll probably add this microbiome tracking ability sometime shortly afterwards. Perl is widely used in bioinformatics, and has been nicknamed “the Swiss Army chainsaw of scripting languages” because of its flexibility and power, and has also referred to as the “duct tape that holds the Internet together.” The Perl language borrows features from other programming languages, most significantly C++. It has powerful and unsurpassed text processing facilities, one of the reasons it saw major use during the development of the Human Genome project. Thanks to Perl, Opus 23 Pro has been made possible.